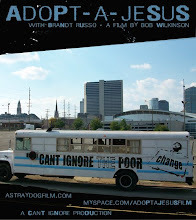 Bob Wilkinson sent me a preview of his new film about Brandt Russo called “Adopt-a-Jesus.” It truly opened a door in to the world that has been making headlines ever since The Great Recession began - the life of America’s homeless. I recalled that Mr. Russo made a stop in Charleston recently, and I guess that is when Bob decided he was worth making a film about. The film is very well made, with great interviews, editing and most interesting in some ways, the music which was credited at the beginning. It was definitely NOT the usual rock and roll nostalgia used in films these days. Russo is a person who found himself homeless and decided to do something about it, creating a bus that runs on vegtable oil and has the words “Can’t ignore the Poor” on the white side of the bus. The bus is his mobile kitchen/home, and it shows him for two weeks traveling around Louisiana, Texas and other spots where he endlessly dumpster dives, looking for food he can feed the poor with and get more vegatable oil to run the bus. After watching the entire film, one can almost see how easy it is to do - and how thousands and perhaps one day millions will be doing the same. I particularly enjoyed the final scene of the film, showing Russo and friends outside the largest church in America with 40,000 members as they actively tell the incoming members about is program. 7 sign up. Like he says, “be the church, not go to church.” He does discuss the misuse of religion in homeless shelters and really focuses on the simply facts of life on the street. He revisits one place where he used to live in LA. It brought tears to my eyes to think of the hell he and millions go through in our criminally capitalistic society every day. 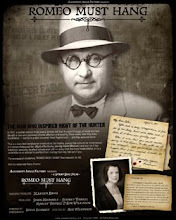 As I have written earlier, the film is being shown in film festivals around North America. 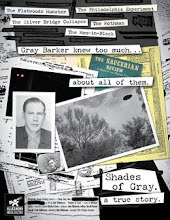 The film is being shown locally at several places. Visit the website for dates including Nov. 30th at WVSU Institute and Dec. 1 in Huntington at Marshall U. Maybe the ManaMeal people would like to see it. Maybe the church people of the state would like to see it - and see how one man has become a contemporary Jesus. After 7 years of holding a stop sign and shoveling asphalt I decided it was time to go back to college. I set off to become a gym teacher where I could get a job playing basketball all day long. One problem . . . I took a film appreciation class. I was hooked, I was taken back to a simpler time when I worked @ a video store and watched movies all day long while earning minimum wage. Life was good! I could watch all of the Samurai movies I could handle while answering the occasional, Where do you keep the new releases? Question. So after 3 and ½ years of college I got a job at West Virginia Public Television to tighten up the skills, bought my own camera and off I went. "Remember everyone you meet has lost something, is afraid of something, and loves something." Opened my eyes to a whole new world..